As a California Certified Radon Mitigation Service Provider, I offer consulting services to home owners and builders to help them come up with the best approach for their specific radon mitigation problem. Contact me for details. (I am not a contractor and do not perform radon installations. See the Connections Page for Certified Radon Mitigation contractors). Please tell them Radon At Tahoe sent you! 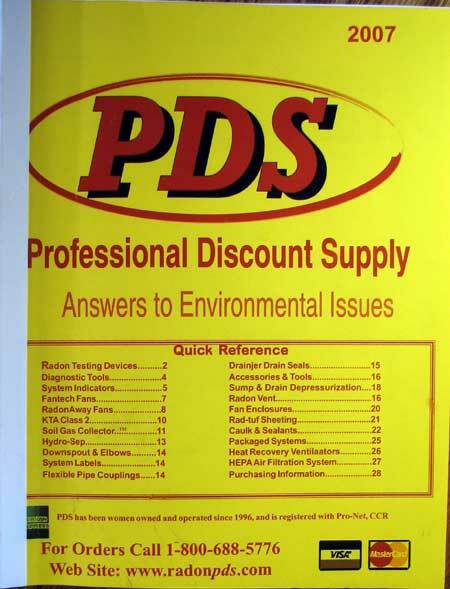 Contact PDS for current pricing and other system recommendations. who saw them on Radon At Tahoe. On first comparison this cloth seems to be more expensive than good old plastic sheeting, but it has much better puncture resistance, will last much longer, is bright white and I think is worth the small cost it adds to the project. 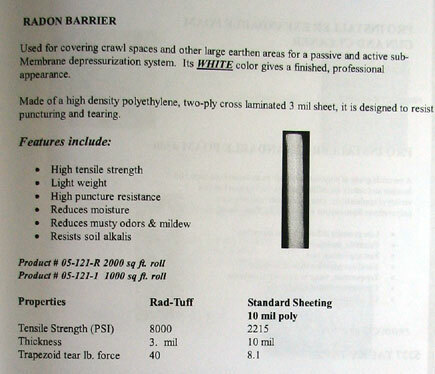 SM7108 sticks radon barrier cloth to concrete and to the cloth itself. It is flexible when dry, which cannot be said of all sealants. This is a necessary component when you want to be under your house once and once only. The possible drawback is the cost of shipping from Colorado. I am in the process of trying to get local supply houses to carry more radon products. Remember not to cover wood posts or sills to prevent termites from doing their work beneath the cover of the barrier cloth. Possible alternative, but not recommended. I have had one report from a customer in the summer of 2008 that PL300 Foam Board Adhesive made for Styrofoam boards, works well to stick plastic to concrete and to itself. One benefit is that it is available locally, at Home Depot and Lowes. I am sending this info just to let you know of my experience with PL300. Monday I received my fan and accessories from PDS. So on Tuesday i was ready to go Home Depot to get the rest of the stuff. I did one more check of the sample polyethylene test strips with the PL300, poly to poly and poly to concrete. These samples were looking ok up thru Monday. When I checked them Tuesday morning, I was able to peal away the poly with very little force from all the samples. I used Husky(Home Depot) 4 mil and 6 mil clear, also Contractor's Choice(Lowes) 6 mil. All of these test strips were now questionable. 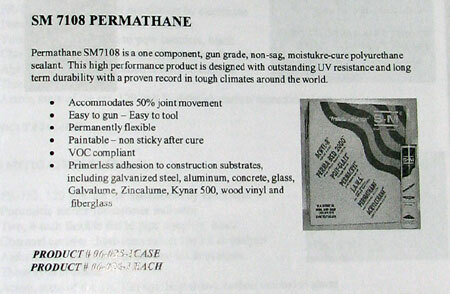 I went ahead and ordered the barrier material from PDS and one case of their sealant Permathane. Since the shipping alone was $100, I'll see if one of the locally available sealants will work with their barrier material as it is supposed to be oil free and I'll need more than one case. I even tried a sample cleaned with mineral spirits and one rubbed with steel wool with no improvement. So for now, I'll stick with the proven stuff , with a little more testing when I get the barrier material from PDS. Bill Brodhead, of WPB Enterprises, Inc. in Northeast Pennsylvania, has taken the time to research the adhesion quality of various adhesives to various barrier clothes. Check his report and "Note that some adhesives work excellent for one type of membrane but have little holding power for another type of membrane." These fans plug into 110 receptacles and can be installed by the homeowner (Class 2 - 24 volt). I like the LV-2133 because if its super low power consumption (only 20 watts!) but the LV-150 is fine too if more suction power is needed. Radon fans are a must for doing the radon project right. Protecting Your Home from Radon - the Do-It-Yourself manual to insure the job is done right. Soil Gas Collector Matting for use under new concrete slabs. 4x3 inch Metal Downspout for use in venting the radon gas from the fan to above the roof. Can be purchased in Weatherguard colors to blend in with the house color and look more like rain gutter than a vent pipe. Available from PDS. Hydro-Sep Water Separator to release moisture from exterior mounted active radon mitigation systems. 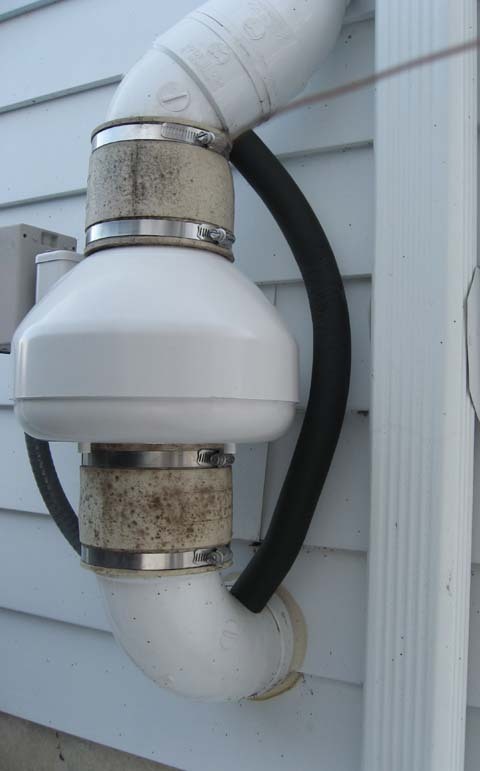 Water vapor in ground soil can condense on the cool vent pipe and drain back into the fan. 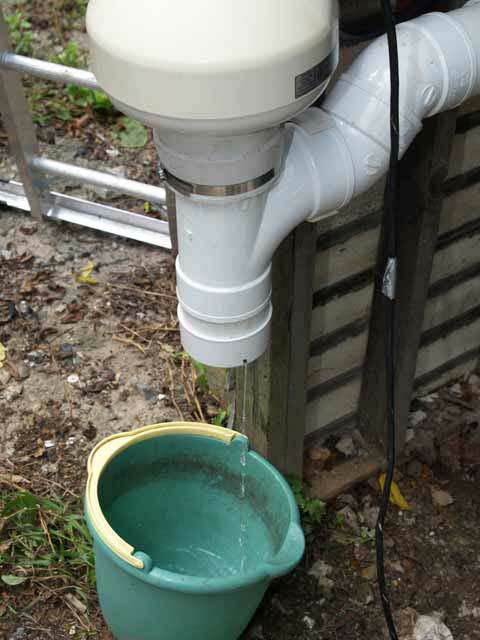 This ingenious device allows the water to drip outside the pipe. Available from PDS. 6. 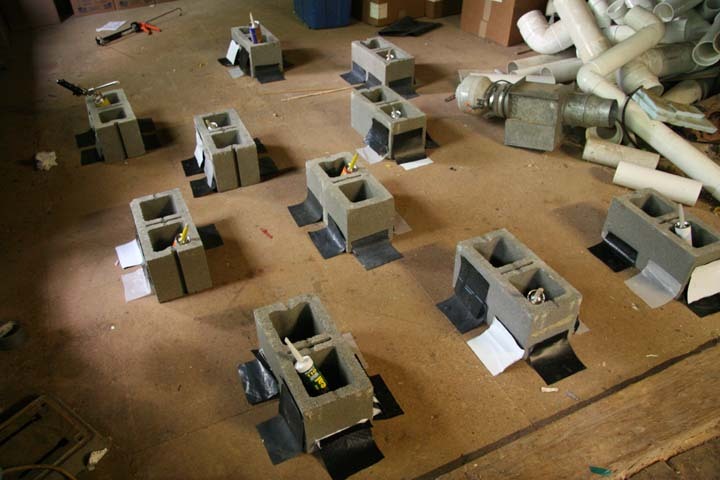 Radon mitigation installer Bill Brodhead (WPB Enterprises, Inc) has an excellent research paper on water bypass systems. Here are some pictures from WPB. 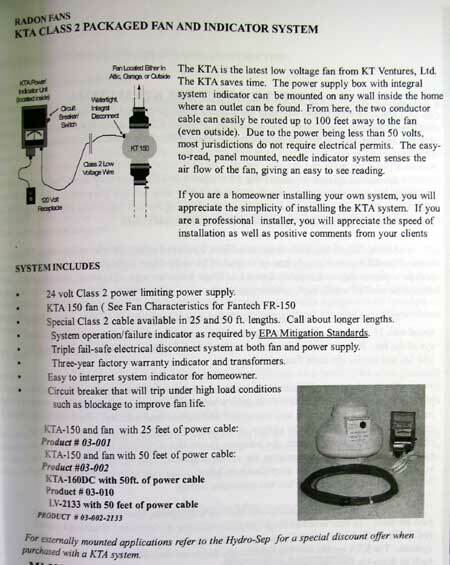 He also shows a detailed explanation with photos on how to install a water bypass system on his web site. Here is a simple "T" drain setup that has potential for eliminating water and ice damage in cold climates. Bill tells me there is no radon blow-back through the drain hole, a slight problem with some of the other methods. Also the heat from the crawl space air and the fan prevent the hole from freezing in winter. I may change my setup to something like this one (someday!). 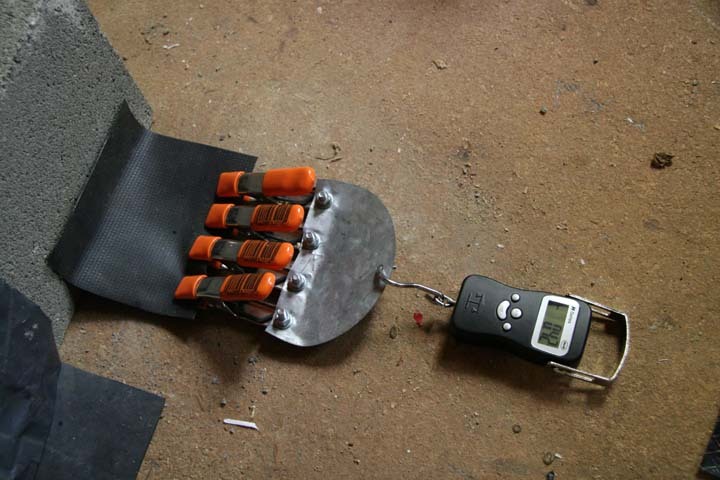 We are always interested in new ways to push the envelope in developing the simplest, cheapest, most effective systems.